"How do I get a data science job?" "First you have to learn: Linear Algebra, Convex Optimization, Differential Equations, Calculus, Algorithms, Distributed Computing, Databases (SQL & NoSQL), Machine Learning, Probabilistic Modeling, Deep Learning, Natural Language Processing, Data Visualization, and don't forget Scala for functional programming, and Hadoop, and Big Data, and Experimental Design, and Functional Analysis, and......"
Your eyes glaze over as you see yourself going back to a dimly-lit lecture hall for the rest of your life. You just read yet another a list of books you MUST COMPREHEND, MOOC's you MUST TAKE, and statistical programming libraries you MUST MASTER to get started in data science. With the plethora of information online, it's immensely unmotivating, overwhelming, and perplexing to navigate a huge list of resources without any context for how they fit together, why they matter, or how they will help you get a data science job. Do you really need to know statistical learning theory and functional analysis at a graduate school level to get a data science job? You end up spending more time debating what to learn than actually making progress. Given your specific educational background and work experience, you still don't know what knowledge gaps you have, which you need to close, and which you can ignore. You don't have time, money, or patience to waste learning things that don't matter. A data science job (with its high profile and lucrative salary) seems more and more out of your reach with each passing day. You wish someone would put you our of your misery by telling you specifically what you need to learn (down to the specific key words and topics), how to put together your data science portfolio, and how to best write your resume to become a data scientist. How would you feel if you woke up tomorrow with perfect knowledge for how to become a data scientist as fast as possible? You would be 100% confident on which MOOC's to take, which books to read, and which statistical programming libraries to use. You'd know the highly specific knowledge gaps you must close given your educational and professional background. Every data science project you completed would make hiring managers sit up and notice due to your topic choices, how you communicate, and what you accomplished. Your resume would be at the top of the "must-talk-to-candidates" pile for every data science job you applied to. Your money, time, and effort would be spent wisely and to great effect in attaining your dream data science job. You'd be motivated, sure, and enthusiastic about having the right data science position within your reach. You'd be a high-profile data scientist with a lucrative salary in no time! Done are the days of sitting at a table being surrounded by books on books on books and endless amounts of data science resources. Throw out that giant stack of textbooks. You don't have to learn most of the stuff people say you need to learn. Each guide will introduce you to tons of fail-safe processes you can follow to the letter that will help you get that data science job as fast as possible. What Are Data Scientists Doing There Today? The Get A Data Science Job Course will direct you in constructing your own highly personalized plan for what you need to learn and what you can safely ignore - saving you time, effort, and worry. And most importantly, the Get A Data Science Job Course will give you the straight truth of what matters and what you can ignore to achieve your dream of becoming a data scientist with a high profile and lucrative salary faster than you've ever imagined. It will be like future you (an awesome data scientist) travelled back in time to tell current you all the right things to do and focus on. Become a data scientist faster than you think possible! Entry level Data Scientists earn $80-$100k per year. The average US Data Scientist makes $118K. Some Senior Data Scientists make between $200,000 to $300,000 per year. Kickstart your data science career today for the cost of a nice dinner. Just $9.99 gives you THREE guides that show you tons of fail-safe processes to figure out specifically what you need to learn (down to the specific key words and topics), how to construct your data science portfolio, and how to best write your resume to become a data scientist. Download instantly, read on any device you have, and set yourself up for data science success. Buy with confidence and without fear. This guide was written to help you. If you're not happy, email team@datascienceweekly.org and you'll receive a refund. Sebastian Gutierrez is the author of "Data Scientists at Work", an interview-based book covering the background, work, and thoughts of 16 of the world's leading data scientists. Sebastian co-runs the Data Science Weekly email newsletter which proudly reaches ~24k subscribers a week. Sebastian is one of four moderators for the Data Science subreddit whose community numbers ~30k members. Sebastian has spoken in Data-related conferences in the US, the UK, and Europe. 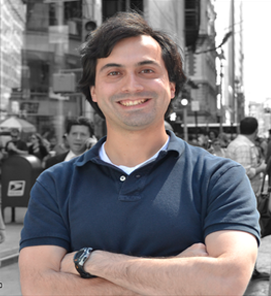 Sebastian Gutierrez holds a BS in Mathematics from MIT and an MA in Economics from the University of San Francisco. You are awesome and you will be an awesome data scientist. Get started today!